Riya, a newly-married young Indian woman from Mumbai who has recently relocated to the United States, is filled with a sense of dissatisfaction and has a lot of complaints with God. To cut her loneliness she joins a cultural institute that is designed as a communication and learning space for migrants from across the world. She rapidly makes friends - Carla from Brazil, Amanda from Spain, Nicole from France, Teresa from Serbia, Kam from China and Shiraz from Afghanistan. Few of them become her close buddies and share their life stories with her. For each of them, it has been a long journey from their past into the present, and each life-story is about resilience, beating the odds and finding joy within the current life. Riya learns that one has to survive happily, come what may, even in tough situations. And she asks the million-dollar question that could bring to an end many of the troubles of earth - When in one class all countries can share everything, can be friends and love each other. Then why can’t it happen on a real globe? 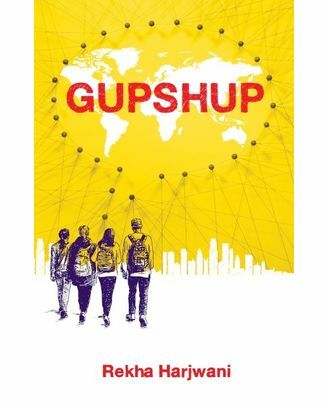 Gupshup would be the ideal companion when next time, you yourself head for far-off shores.